Looking to start your first ever smart home project? Then Koogeek’s latest deals will keep you on your toes for sure. Smart home accessories are getting very cheap over time but manufacturers are trying their best to throw in discounts on an occasional basis to make sure that everyone gets to try out their stuff without having to spend top dollar. Koogeek is one of those companies and they are very eager to give everyone a shot at their RGB light strip and their smart plug which connects via WiFi. Both of these products are amazing in a sense that they do not require a hub to operate at all. You simply connect the accessories to your existing WiFi network, set them up for use from your phone or tablet and you are good to go in a few seconds. 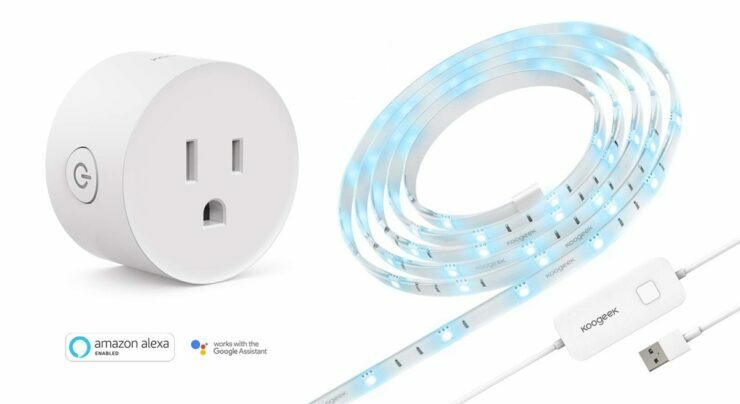 Both products work flawlessly with Google Assistant and Amazon Alexa, but the light strip has another trick up its sleeve – HomeKit support. So if you well vested in the world of Apple and Siri, then you will be pleased to learn that HomeKit support is there in this light strip. And for $29, it’s insanely cheap once you factor in the fact that you can dial between 16 million colors, making it an ideal little accessory to create a brilliant ambience at home or office. If you’re all set to grab these wonderful little products, you can grab them from Amazon below. And remember, this is a limited time deal only and it’s best you make your move fast if you want to take advantage of these deals.